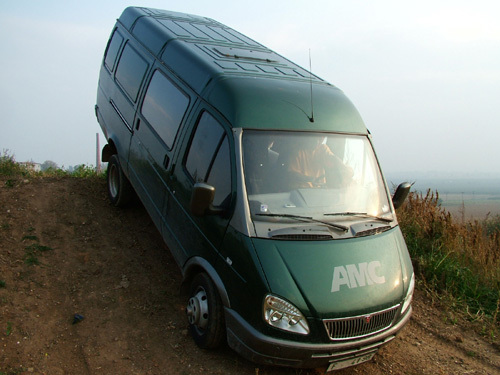 After offroad lorry called 33027, this 4x4 van version is the most successful GAZelle model worldwide. The reason is simple. There is simply no competitor in the same price category. And if there is something else, calling itself “The offroad van”, it is either customer trap in form of 4x4 van with frameless body, or it costs 40.000 EUR more. Only in Russia it is possible to mass produce 4x4 utility van with cassis, equipped with two solid axles mounted on leaf springs! This conception is traditional only at the biggest trucks, but GAZelle brings the uncompeted toughness also to people, who have driving license permission only for light vehicles up to 3.5 ton. At the first sight noticeable stunning ride height of the GAZelle, as much as large dimensions, predetermine this vehicle for utility usage. However this is not the only one. You wouldn’t be the first one, who chosen GAZelle 27057 as the expedition vehicle for vacations in hardly accessible locations with undeveloped service stations network. Simplicity, reliability and easy reparability are the main assets of the GAZelle 4x4 vehicles. Uncompeted variability and huge number of different platforms and equipment are the next reason, why GAZelle was chosen by hundreds of companies over the Czech Republic, for example as the mobile workshop solution, emergency truck, monitoring vehicles, etc. GAZelle 27057 simply unites all the parameters of light van and tough truck, which always lead you to choose the first, or the second choice. Now you don’t have to do compromise.